Unity Health therapists with rehab patients. The Unity Health Foundation plays an integral role in the Unity Health system as well as the other communities it serves and has since 1997. 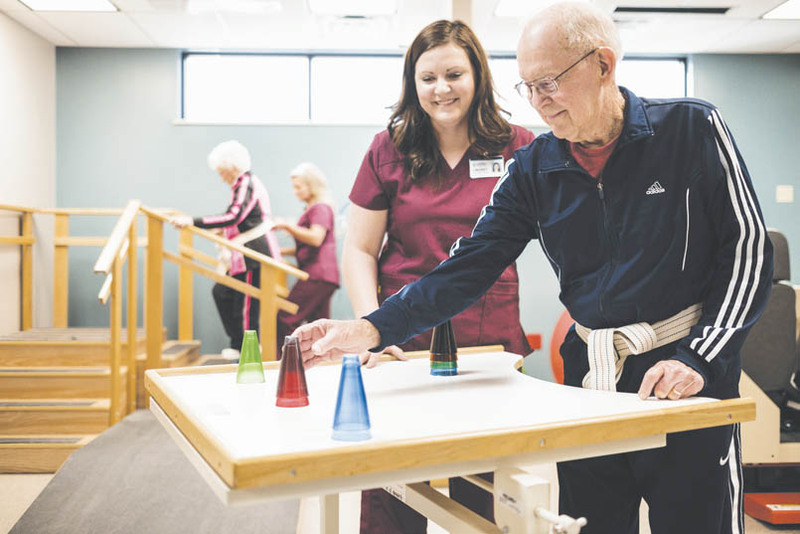 The Foundation makes connections in the community, partners with local businesses on projects and fundraisers, and serves as an avenue for enhancements to Unity Health. The Foundation is a not-for-profit corporation established as a charitable organization to provide support to Unity Health. The Foundation is committed to medical excellence and compassionate care, as well as to improving the overall health of the entire Unity Health service area. The facility at the Unity Health – Specialty Care Campus is in need of renovation to enhance experience. Renovations will include widening of doors throughout the facility, patient rooms, family room, dining room and gym area remodels and a new covered entrance, all with a home-like environment and extra safety measures for patients and associates. Funds will go toward adding 10 patient safe handling rooms throughout the Unity Health – White County Medical Center Campus. These renovations and the addition of the Hoya Lift system will make caring for patients safer for them and associates. These UV-C light robots are used to go the extra mile when disinfecting patient rooms, and a way to make the hospital the safest facility it can be for patients and families. Unity Health was the first in the state in implement the Xenex Program as a way to enhance patient and associate safety. These campaigns help provide the hospital with funds for renovations, new equipment and specialized projects to enhance patient care. The Foundation’s most recent campaign was “Miracles Happen Every Day,” which provided upgrades and renovations for the Unity Health – White County Medical Center New Life Center. Unity Health Foundation Executive Director Cassandra Feltrop has been with Unity Health for 20 years and part of those successful campaigns. She oversees all aspects of the Foundation, and has played a key part in the growth of the organization. The Foundation oversees the Spirit of Unity, a program for patients and loved ones to honor and show their gratitude to a Unity Health associate who impacted them during their stay; the Unity Health Pep Club, an associate membership program to give back to the hospital; and the Healthy Women of Unity program, which empowers and encourages both associates and women in the community to live a healthier lifestyle. They also work with local businesses and Unity Health clinics in the region the Unity Health system serves. Through their work, Foundation team members create long-lasting relationships and partnerships with community members for the betterment of local healthcare. Resources for the Foundation are obtained from donations, memorial gifts, planned gifts, special events and other sources. The Unity Health Foundation works to develop a lasting partnership with the community to preserve, sustain and develop Unity Health for years to come. To learn more about the Unity Health Foundation and the “Home is Where the Heart is” campaign, please visit unity-health.org/foundation.